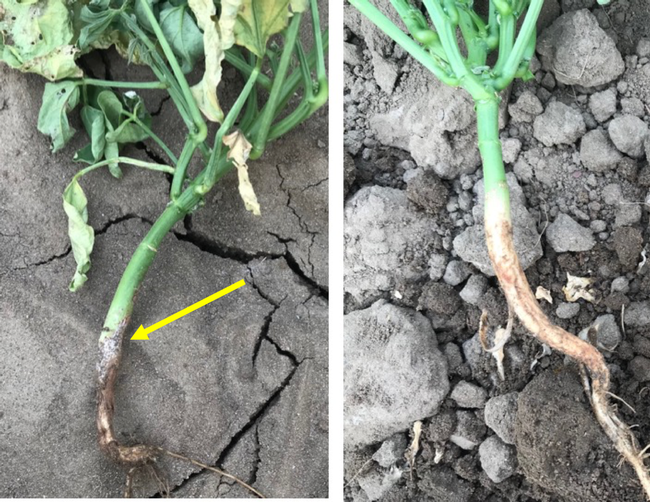 A baby lima bean field in the Sacramento Valley was recently found to be infected with southern blight (Sclerotium rolfsii), a fungal pathogen that's found in many crops. The field was double-cropped with barley and planted late June. White mycelium of southern blight, a fungal disease on lima beans (left with yellow arrow) compared to a healthy lima root (right). Symptoms and signs: Initial symptoms of southern blight include a yellowing of the foliage with a slight darkening of the stem, just above the soil line. Lesions rapidly develop, girdling the stem, causing sudden and permanent wilt of the plant. The fungus grows downward in the stem, causing rot. White mats of mycelium develop on the stem and nearby soil. In a few days, tan to brown spherical sclerotia (tiny compact masses of hardened fungal mycelium) may appear on the fungal mat. If present, these are a good diagnostic feature of this disease. Southern blight infected lima bean root (left); small tan sclerotia that are diagnostic of the southern blight fungal pathogen (yellow arrow). Comments on the disease: Southern blight is usually a minor disease of beans and other crops in California. However, high temperatures above 85°F together with high moisture favor the disease. High summertime temperatures combined with a later planting date likely stressed the young lima plants in this field, making them more susceptible to this disease. The best time to plant baby limas in the Sacramento Valley is around the third week in May; for large limas it's early May. Last year was a big year for southern blight in many crops, likely due to late plantings and high heat stressing the plants. This year the disease seems to be a little less common, but is still widely detected on many crops, from Kern to Sutter counties. Detections in the northern counties of the central valley have become more frequent in the last three weeks. Disease Management: The fungus attacks a wide range of plants and survives for a long time in the soil as sclerotia. Rotations are not considered effective since this pathogen has over 500 hosts. However, it is thought that rotations to corn or small grains for at least 2 years may reduce inoculum; studies are underway to determine whether these rotations are effective. For most crops, southern blight resistant cultivars are not available. However, for vegetable crops such as tomatoes, there are some rootstocks reported to be resistant to southern blight, which are currently under study in field trials in California. Discing and burying plant refuse helps destroy sclerotia. 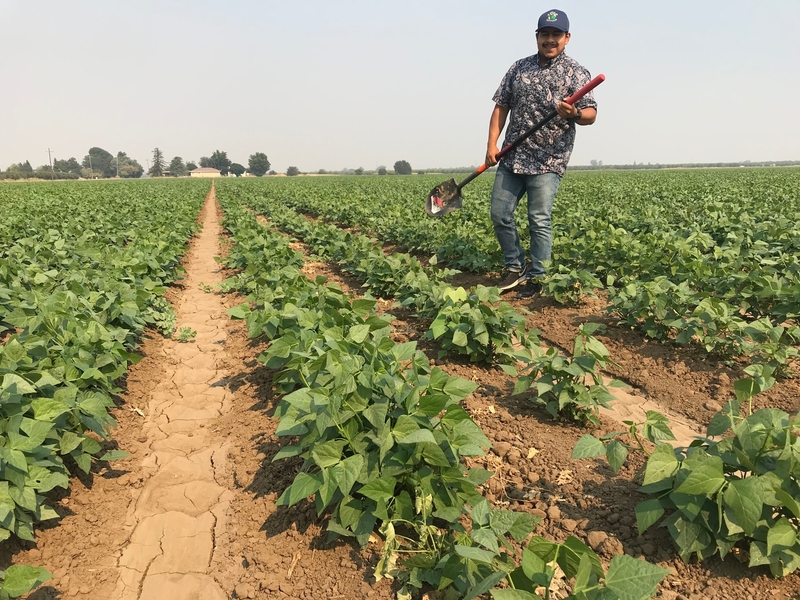 UCCE Field Assistant Jesus Martinez in a lima bean field with some stand loss due to the fungal pathogen, southern blight. Figure 1. Lima bean root and crown rot. I visited a lima bean field in the Delta at the beginning of June. 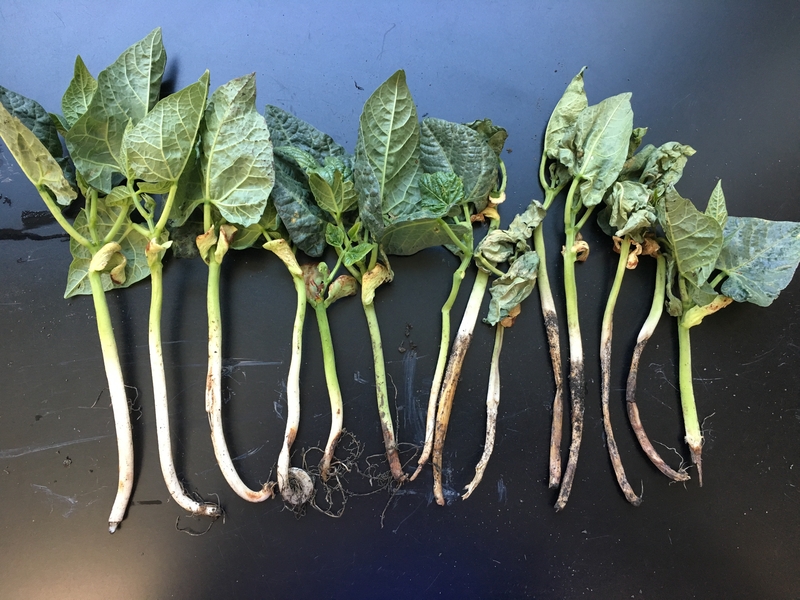 The beans were showing what appeared to be dampening off symptoms (Figure 1), and dying plants were leaving large gaps down the rows. The problem was pretty widespread throughout the field. Two rows of beans were planted down 60-inch beds with a single drip line buried down the middle of the beds, at about 10-12 inch depth. The soil classification is a mucky clay. While the beans were planted in May, the grower admitted that the soil was still perhaps a bit cool for planting beans (48-52⁰F). (Ideally, we would wait for the soil temperature to reach 65-70⁰F before planting limas.) Additionally, the seed was planted quite deep (4-5 inches), when it probably should have only been planted 1-2 inches deep, provided good moisture in the seedbed. With these conditions, my tentative diagnosis was Rhizoctonia solani because of the reddish-brown lesions I was seeing on the roots. Usually, a seed treatment helps mitigate or control these types of seedling diseases. The grower and I checked a bag of extra seed in the barn, and there was a fungicide seed treatment on the seed. I sent plant samples to the UC Davis Plant Pathology Diagnostics lab for confirmation on disease. Rather than Rhizoctonia, the lab identified Fusarium oxysporum on all of the plant tissue submitted. While Fusarium oxysporum is the causal agent of Fusarium wilt (a.k.a. Fusarium yellows), the symptoms on these plants indicated root and crown rot, and NOT yellows. Fusarium root rot is common on other beans; however, it has not been a common problem in California limas. For this particular field, its cropping history has been various vegetables for the last couple years, including tomatoes with a severe Fusarium problem in 2016. Rotating out of beans or vegetables to grains would be a good management strategy for future years because Fusarium can live in the soil for several years. Fungicide seed treatments may also help. In this particular case, we talked about managing water well to try to avoid moisture stress (too much or too little) of the current crop to optimize the crop that is there. The grower and PCA assured me that they can manage the moisture well with the drip irrigation on this soil type. For future bean planting, waiting until soil temperature is warmer and not planting as deep would also be important strategies.